Roughshod Records celebrated its 30th Anniversary on 13 June 2017! Welcome to Roughshod Records, a small Independent Country Music Label dedicated to keepin' that traditional country sound alive since 1987! Eight Cassettes and 54 CDs later we're still running and constantly working on producing exciting new songs that will have your toes tapping and warm you up from the inside out! Mike Johnson, Country Music's No.1 Black Yodeler, is still at the helm, and on-board since August 2012, and breathing new life into the label, is James Adelsberger, our recording artist, studio engineer, and co-producer. Our talented musician is also a published composer, songwriter, BMI songwriter member, owner of J. A. Music Publishing and a member of the National Traditional Country Music Association. On 7 May 2016 during a Roughshod Records SideKicks Show featuring James as the Special Guest Performer, Mike Johnson had the added pleasure of introducing James Adelsberger as the new co-owner of Roughshod Records! Visit our PHOTO GALLERY for tons of photographs! you might see someone you know! 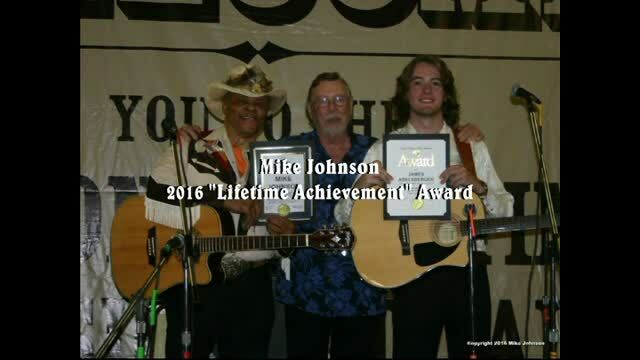 On 29 August 2016, in a ceremony officiated by Bob Everhart, president of the National Country Music Association, James Adelsberger received the Rural Roots Music Commission 2016 "Instrumental CD of the Year" Award and Mike Johnson received the National Traditional Country Music Association 2016 "Lifetime Achievement" Award on the Main Stage at the week-long 41st Annual Old Time Country Music Festival in LeMars, Iowa. To view their awards ceremony, click the video in the right-hand column. On 31 August 2015 the Rural Roots Music Commission presented James with the 2015 "Pure Country CD of the Year" Award for his CD "Old Time Country Songs Are They Really Dead and Gone?" at the 40th Old Time Country Music Festival in LeMars, Iowa. Roughshod Records released its 51st and 52nd CD albums on 13 August 2016. Mike Johnson's 14-song "Let Me Die In a Honky Tonk!" and James Adelsberger's 13-song "My Heart Still Sees." Hang onto your hats, it's gonna be an exciting ride!